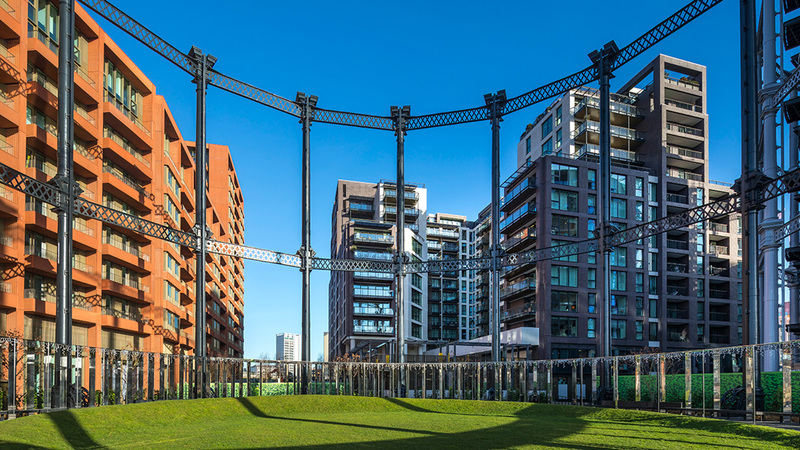 Kings Cross Central Limited Partnership is delivering a vibrant new part of London, on previously underused industrial wasteland. It is the largest mixed use redevelopment in single ownership to be developed in central London for over 150 years. The 67 acre masterplan, designed by development partner Argent, builds on the areas strengths and rich cultural past. When complete, the Kings Cross Development will feature 10 new squares, 20 new streets and 50 new and refurbished buildings, including homes, retail and office spaces, entertainment and education facilities. It will provide almost 2,000 new homes and benefit 45,000 people who will directly use the area. This new London postcode; N1C is building on the area’s diverse and dynamic community next to London’s best connected transport hubs. Ramboll has worked on no less than 15 sites at Kings Cross. The first in 2009, with the now completed award winning Plimsoll Building (P1). The 12 storey building sits alongside the canal and a beautiful communal urban park. The development has 255 stunning apartments, a shared landscape podium garden with an additional rooftop winter garden, all located over a school for hearing-impaired children, primary and pre-school, and other community facilities. Ramboll has also played pivotal roles on plots: S1, S2, S3, S4, S5, T1, T2-T4, T6, R3, R5, R6, W-Zone, Filling Station and the district heating energy centre; providing district heating and cooling across the development. Our engineers and consultants have delivered and continue to deliver a range of services across the site, including structural and civil engineering, asset protection and ground borne acoustics. Locally we have also refurbished Kings Cross landmarks including: Great Northern Hotel and The Lighthouse Building. During the Victorian era, the site was an important industrial transport hub, which by the late 20th century became defunct. In 1996 the site’s future potential became a reality when the Channel Tunnel Rail Link from Waterloo to St Pancras decision was made. The site’s history and its future pose significant challenges for all who are delivering the new masterplan, with innovation being instrumental to the successful delivery of projects that Ramboll has worked on. The site’s rich industrial heritage also poses contaminated land issues due to historical industrial and rail uses. With High Speed One railway bounding the site and Network Rail Thameslink tunnels located directly below the new buildings, Ramboll has provided innovative structural framing solutions bridging over railway tunnels below. Furthermore successful negotiation with various stakeholders prior to and during construction of large scale buildings in close proximity to railways and other asset protection has unlocked value for our clients. The developments at Kings Cross meet strict sustainability credentials, residential buildings meet Code for Sustainable Homes Level 4, whilst the commercial developments targeting BREEAM Excellent/Outstanding. The site’s energy centre located below one of the buildings, also designed by Ramboll, will provide most of the development’s heat demand alongside the Ramboll designed district cooling pod, contributing to the developer’s aims to create one of the more sustainable developments in the UK.